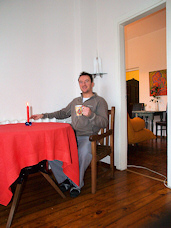 On one of our last trips we used Regina House apartments in Vilnius. 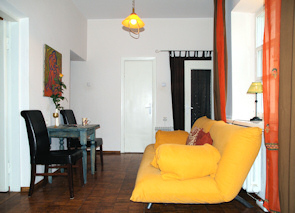 The flat we stayed in is located in the excellent Old Town location, which definitely has a lot of advantages. 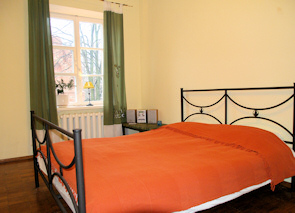 Close to the very centre of Vilnius Old Town, yet tucked away in a quiet residential Sv. Mikalojaus Street, was the combination we were looking for when searching through the apartments in Vilnius. It’s only 5-min walk to the restaurants, bars and clubs on the busy Vokieciu Street. 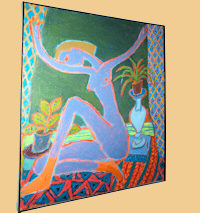 The apartment is decorated in a minimalist style with colourful paintings on the walls, which creates a cosy and homely feel about it. Two spacious bedrooms decorated to create an old fashioned look. The windows overlook the quaint Gothic Church of St.Nicholas and a statue of St.Christopher (patron saint of Vilnius) in the yard, which adds to retaining the character of the past. At the weekends you can see some weddings taking place there. The street itself is rather quiet and has an old times feel to it. 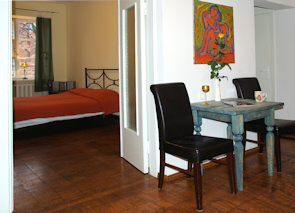 The apartment has two bedrooms with double beds. Bear in mind that there’s no sitting room as such, except for a couch and a table in the wide hall, which might be not for everybody’s liking. The flat was probably designed for two couples or a few friends travelling together. 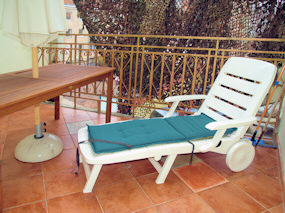 This apartment has a fully equipped kitchen, bathroom, washing machine, cable TV and musical centre. The flat also has a large balcony but because it's overlooking the inner yard, it doesn’t provide a great view, although it could be used as an extra space in summer time. On your request they provide a free pick up at the airport, railway and bus station. 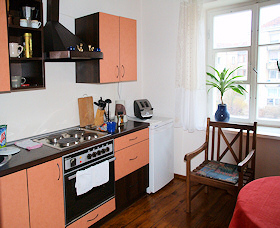 Regina house has 6 other apartments in Vilnius Old Town locations. Our first choice was another flat with a lovely fireplace in the same building next door, but unfortunately, it was already booked. We’ll keep it as an option for our next trip. 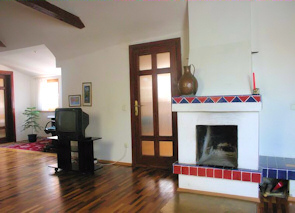 It is a very spacious apartment with 2 bedrooms with king-size beds. High speed WF. Digital TV and washing machine.